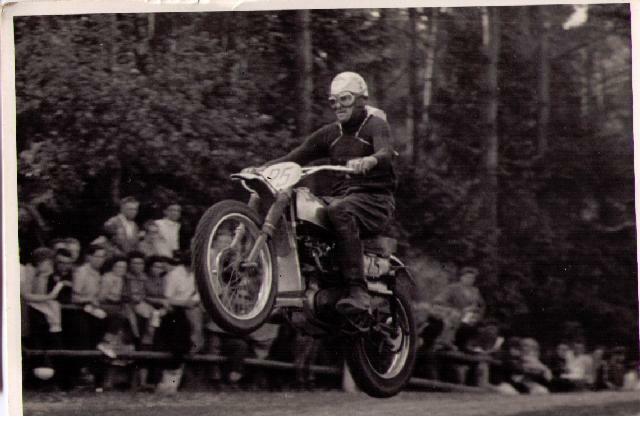 Bob Walpole talks about survival in the MX Continental Circus of the Old Days. Time period early 1960s. 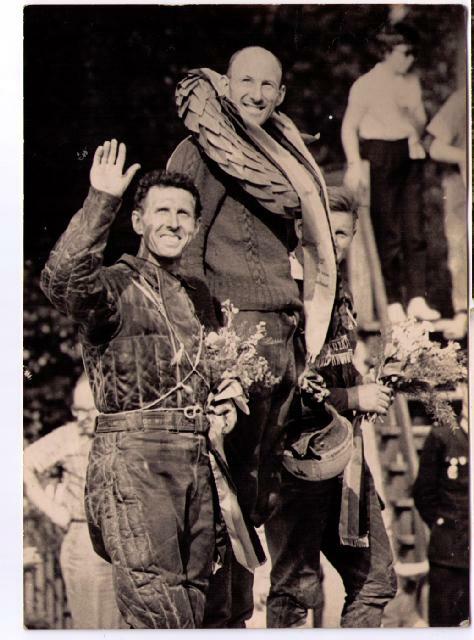 Bob Walpole (centre with the winners garland) takes the glory at Teterow Grass Track in East Germany. A proud moment for all the work getting there! Bob Walpole hails from Victoria in Australia, but nowadays lives North of Brisbane in Queensland. He's one of life's survivors. He can put up with any hardship, challenge, or occasional injury. He's big, wiry & not really the sort of guy to have a fall out with on a dark night! Just last year he (now aged 70) & his wife drove a 4WD Landcruiser from South Africa all the way North to Egypt, but not on the easy route. But that's another story altogether. But to substantiate the toughness & resilience of this guy, try this. He broke his right forearm at a Belgian MX in the mid 60's. It needed a rod inserted to support the arm. He was totally broke & needed food, so he had to ride at the next event to get some start money. To prevent any undue pressure on the broken arm, he fitted the throttle twistgrip to the left side bar. BUT think about that being hard enough, remember that everything goes in reverse and to open the throttle he had to twist away from the body, opposite to the normal way! Somehow he coped with that, but the pressure on the broken arm was so much that it bent the rod like a boomerang inside his right arm, so any thought of being able to get it removed when the break healed was out of the question. So today Bob still has a right forearm that looks like a boomerang! This is a story (from Bob Walpole) relating to one year of 5 of my time in the UK racing. Time is not very favourable to the memory, things get forgotten, time is distorted, but the basis of the story is true. Very early at the start of 1963 I had a letter from the ACCA to ride in a WC GP in Europe. This was the Auto Cycle Union of Australia, the controlling body of motor cycling sport, later on changed to Motor Cycling Australia. I will digress for a bit. To ride in Europe one had to have an International Licence, the ACCA in Australia could not issue a rider with one because the ACCA was not then directly affiliated to the FIM. Anyone from Australia had to go to England and prove to the ACU of GB that you were eligible for one, which was very difficult, due to the nature of the moto-cross tracks in Australia at the time were very much like the grass tracks of the UK. This was the very first European MX I rode. After riding in the then relatively smooth. hard & dusty tracks of Australia, I didn't think this sort of track existed let alone race 3 races of 45 minutes plus 1 lap in a day! Back to the letter from the ACCA. I was informed I was to be the Australian Rep for the coming 250cc World Championship, so contacted the Bultaco factory in Spain, who were willing to supply a bike for the coming season. From then on things went PEAR shaped. I decided to go to Spain collect the bike and do two races in England to get used to the bike. On the way back, 100kms from the ferry but still in France, a noise in the engine department of my van. I had a small problem or so I thought, all I had to work in was a pair of pyjamas and overalls, which is not too bad when the temperature was warm. It was not warm, it was freezing! It was fortunate to have stopped where I did, out side a house of some American service personnel who were having a party celebrating the arrival of his wife in Europe. I had taken two females on this trip, as soon as I stopped the Yanks invited the girls in to join them. That was good idea, let me get on with the job of removing the sump to find the cause of the "little man with the big hammer". By the time I had found out I could not fix a broken crankshaft it was 11 pm & 5 degrees below and my hands were frost bitten. The very friendly Yanks were a life saver, nice fire, nice company and a couple of Rums made life a lot better. I was in deep trouble. A broken down van and bikes, tools and all my gear in Europe, had to hitch a ride to England, buy another van, return to France, off load all my gear return to England just in time to drive 4 hours to Somerset for the first race on the Bultaco! Wouldn't you know, it was cancelled due to heavy rain. Not to worry there was another race next week, another let down, in the last race going up a very steep hill into the setting sun, could not see a stopped rider due to the sun and dust, bang stopped very quickly, with my nose on the bar across handlebars, result one broken nose, and badly bent forks on the new bike. The next week I had to be in Barcelona, about 2,000 Kms away, for the start of the 250cc World Championship. It was then I found the steel in the bike was like plastic. Here is a list of problems I had in the coming races - handle bars broke twice, fitted English bars, clamps were metric size so the bars were too big - bars moved down & dislocated my thumb. Down bar on frame broke many times, the gusset that was welded cracked a number of times all due to the lack of movement in the forks, swinging arm broke due to lack of movement in rear shocks, seat broke due to the two previous problems. One of two gear selector forks in the gear box broke. Not being able to get spares from the factory, had to use first and second gear only. I would arrive at a meeting do the practice qualify, then rebuild the bike Saturday night, only for it to break again in the race. If you think I was disappointed, you are not wrong. The bike ridden by Oriel Bulto, a relation of the guy who owned the Bultaco factory , was completely different to the one I had. He had changed everything except the motor, I must say the engine was very, very good. I entered for a mountain grass track in East Germany. To do that meet I had to take the one & only gear selector fork left from first & second and use it in third & fourth gear! Due to such a high gear it took half a lap to get it on then it was as quick as a 500cc Triumph. But it didnâ€™t last the race distance, due to lack of jets for the carby, the mixture was too lean & burnt a hole in the piston. Despite all the hardships the Teterow Grass Track was "something else" - just like a road race on grass, with jumps at over 160 kph that had you lingering in the air for ages with a hope that Mother Earth might just come & meet again! Not having a spare. I overcame the little hiccup by using a quarter inch nut and bolt burring it over so as not to come undone. I continued the year never finishing a race on that machine the repair lasted I did lasted but the bike did not. The next drama. In the 60's it was the time of the "Cold War" between East & West. No one could go behind the without a very special reason. Racing a motorcycle was one of the special reasons. To go to Russia was REALLY special. Racing Moto-Cross overcame lots of problems, if police ever stopped you for some traffic offence, one only had to open the rear door of you van , have them look inside show them your moto-cross bike and all was forgiven. Getting into Russia was a hassle, getting out was no better. All the time we were in Russia we had a Russian guide (linked with the dreaded KGB Police) with us all the time to make sure we did not send any information to the US or the West. Leaving Russia in convoy with all the other Moto-cross riders, we got to the Polish border from Russia, where they would not let me in due to a visa problem. They said I had to return to Russia, when I tried to return to Russia they would not let me back in because my visa had expired! There I was stranded - could not go back and could not go forward, stuck on this long bridge between the two Iron Curtain so called â€œfriendly neighbourâ€ countries, over a deep river. After 5 hours I was allowed back into Russia. I knew I had get to the guide we'd had since our arrival in the country. He was on his way back to Moscow and was the only person who could arrange to get me into Poland and the next Moto Cross. Apart from the racing there was also a question of money & food, both running on "empty". I wanted to leave for Minsk 400kms away immediately. I knew where they were staying the night, and would be leaving very early in the morning, only to be told in no uncertain terms and very sternly, I could not drive at night because of a curfew, they told me to sleep the night and go in the morning. I knew I had to get there before he left for Moscow. If I had missed him it meant I would have had to return to Finland via Moscow and Leningrad to get into Poland that would have meant thousands of Km's and with no visa, no Russian money I could have ended up sent to Siberia and the salt mines. I was allowed to start the drive at day break. I made record time to Minsk made it with minutes to spare - they were just leaving. Then it was a long drive back to the border and go through all the customs BS again, this time all went according to plan. I entered Poland but due to another problem, didn't get to the race meeting, because of lack of visa or some other manufactured detail. I cannot remember what happened after that, other than I caught up with Tim Gibbes at some MX meeting in France. 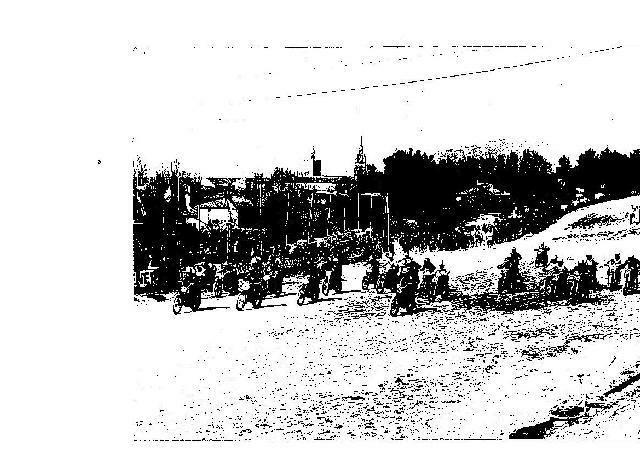 The French MX circuit at Pernes-Les-Fontaines seems to have been there since MX started. 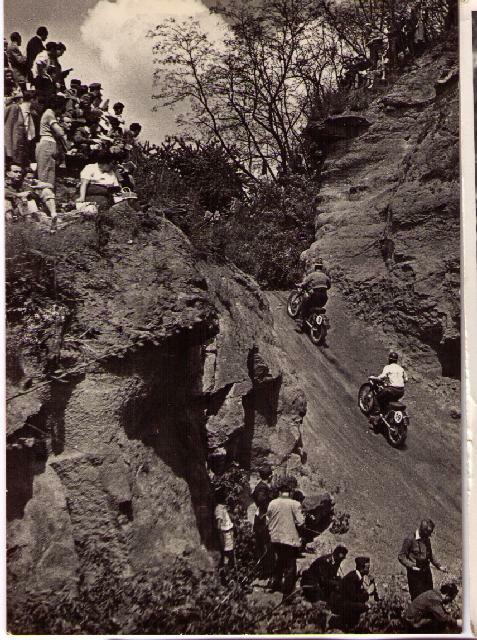 This was bout 1962 for the World Championship 250cc Grand Prix when Dave Bickers GB on his 250 Greeves & Torsten Hallman, Sweden, on a Husqvarna reigned supreme. This circuit is still used for major International events to this day. The last meeting of the year for me was in San Sebastian. I was very pleased to give that dreaded two wheel piece of crap called a motorcycle back to Oriel Bulto the nephew of the owner of the Bultaco factory. After the race finished I had arranged to meet an American rider to assist me getting my van that I left in France back to England.